The fascinating phenomenon ferromagnetism is far from being fully understood, although it surely belongs to the oldest problems of solid state physics. For any investigation it appears recommendable to distinguish between materials whose spontaneous magnetization stems from localized electrons of a partially ?lled atomic shell and those in which it is due to itinerant electrons of a partially ?lled conduction band. In the latter case one speaks of band-ferromagnetism, prototypes of which are the classical ferromagnets Fe, Co, and Ni. The present book is a status report on the remarkable progress that has recently been made towards a microscopic understanding of band-ferromagnetism as an electron c- relation e?ect. 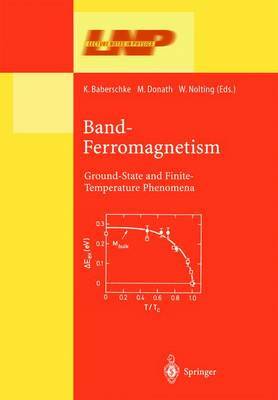 The authors of the various chapters of this book "Band-Ferromagnetism: Ground-State and Finite-Temperature Phenomena" participated as selected - perts in the 242nd WE-Heraeus-Seminar (4-6 October 2000) held under almost the same title in Wandlitz near Berlin (Germany). It was the second seminar of this type in Wandlitz. (The ?rst in 1998 dealt with the complementary topic of the physics of local-moment ferromagnets such as Gd). Twenty-six invited spe- ers from ten di?erent countries together with ?fty-?ve further participants, who presented contributions in form of posters, spent three days together discussing in an enthusiastic and fertile manner the hot topics of band-ferromagnetism.